Cell-free foetal DNA (cffDNA) originates from apoptosing trophoblastic cells of the placenta. These apoptosing cells release foetal DNA into the maternal bloodstream, which is referred to as cell-free foetal DNA. Foetal fraction is the amount of the cell-free DNA in the maternal bloodstream that is of foetal origin. 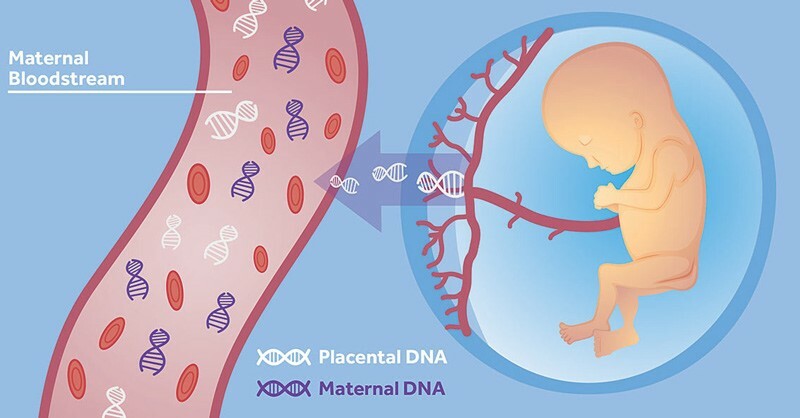 The American College of Obstetricians and Gynaecologists noted that 3–13% of circulating cell-free DNA is of foetal origin at 10 weeks’ gestation. Several studies have noted that there is a large variance in the fraction of cffDNA between patients. Foetal fraction (FF) is only one parameter used in the quality control (QC) assessment of an NIPT sample. As all foetal fraction estimation methods are imprecise, foetal fraction cannot be relied upon as the only indicator of the quality of the NIPT result. This is why TriScreen does not cancel samples based on FF alone – even an estimated “low” FF. In addition to FF, TriScreen also uses other QC metrics to assess each sample individually to provide calls/results with confidence, which include: Sequence coverage profile, alignment & uniformity of sequence reads, and sequence read depth. In the case of a low FF (such as <1% fetal fraction) – if all of these other QC parameters look good, the lab feels confident in the result because the analysis server has a build in system where there is a requirement of a certain number of million reads per sample according to the FF obtained in order for the QC to pass. As such, the TriScreen test does not use FF in isolation to exclude samples.